Toby Wolson provides forensic consultations and training in bloodstain pattern analysis, DNA analysis, serology, and forensic biology. Workshop participants will participate in practical exercises to enhance their ability to interpret complex bloodstain patterns deposited on fabrics, textiles and clothing. This will be accomplished by the participant’s dripping, splashing and transfering liquid blood onto fabrics, textiles, and clothing and observing the macroscopic and microscopic interaction of the blood with the substrate. 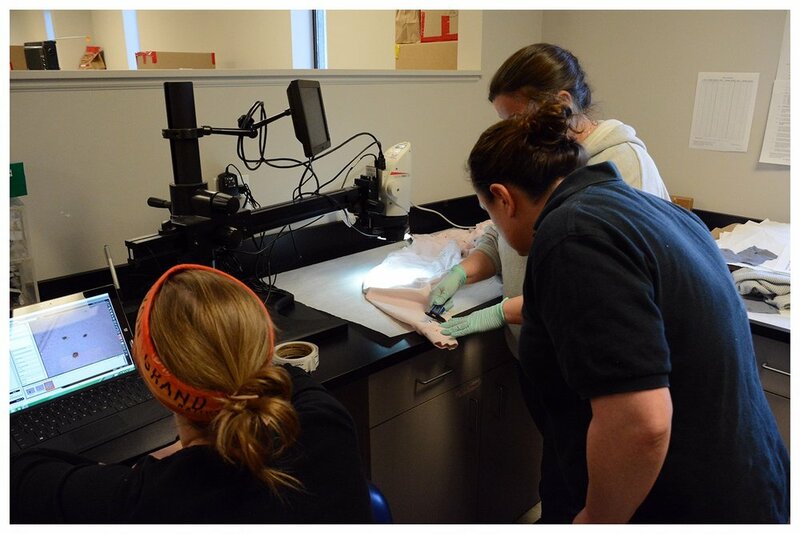 Workshop participants will also learn to evaluate bloodstain evidence from digital files by working on cases provided in a digital format. In addition, the participants will receive training in the writing of bloodstain pattern analysis reports. Enhance the participants skills for the examination of bloodstained clothing. Enhance through lectures, experimentation, and laboratory practicals the participants understanding of fabric composition, construction, and finishes that can affect the appearance of the bloodstain patterns. Enhance through lectures, experimentation, and laboratory practicals the participants understanding of how liquid blood interacts with fabrics. Enhance the participants skills for writing bloodstain pattern analysis reports concerning the examination examination of clothing. Enhance the participants skills for presentation of bloodstain pattern evidence on clothing as an expert witness. Enhance the participants skills for the analysis of bloodstain pattern evidence provided as digital images and documents. Workshop participants will participate in practical exercises to enhance their ability to document and interpret complex bloodstain pattern crime scenes and evidence. This will be accomplished by having the participant’s process bloodstain pattern crime scenes and by examination of the clothing that was worn while the scenes were created. In addition, the participants will receive training in the presentation of the bloodstain pattern evidence and in the writing of bloodstain pattern analysis reports. Enhance the bloodstain pattern reconstruction and documentation skills of the bloodstain pattern analyst. Enhance the bloodstain pattern identification and interpretation skills of the bloodstain pattern analyst. Enhance the bloodstain pattern analyst skills for the examination of bloodstained clothing. Enhance the bloodstain pattern analyst skills for writing bloodstain pattern analysis reports. Enhance the bloodstain pattern analyst skills for presentation of bloodstain pattern evidence as an expert witness. Violent crimes usually result in bloodshed. When physical forces act upon liquid blood, patterns will be deposited on the various items at the crime scene, as well as the clothing of the individuals present during the activity. These patterns can yield valuable information concerning the events that lead to their creation. The information can then be used for reconstruction of the incident, as well as to evaluate the statements of the witnesses and the crime participants. Bloodstain pattern evidence can be of value in the investigation of any violent crime in which bloodshed occurs. Teach the investigator how to identify bloodstain pattern evidence at the crime scene. Teach the investigator how to properly document bloodstain pattern evidence. Teach the investigator how to properly preserve the bloodstain pattern evidence. Teach the investigator how to reconstruct bloodstain patterns at the crime scene. Provide the foundation for teaching the investigator how to interpret bloodstain pattern evidence. Teach the investigator the safety and health issues associated with bloodstain pattern evidence. To be able to recognize bloodstain pattern evidence at the crime scene. To be able to properly document and preserve the bloodstain pattern evidence. To be able to properly use bloodstain pattern terminology. To be able to identify simple bloodstain pattern types. To obtain basic bloodstain pattern analysis knowledge that will be the foundation for additional training culminating in being able to evaluate and interpret bloodstain pattern evidence and render an opinion concerning that interpretation. The purpose of an Introductory Bloodstain Pattern Analysis Workshop (BPA) is to provide the basic tools and knowledge necessary to begin training toward being a competent and qualified bloodstain pattern analyst. Successful completion of an introductory BPA workshop does not qualify you as a BPA expert. To become an expert in BPA, you will need to continue your studies by attending and successfully completing advanced BPA training. You will also need to practice what you have learned in the workshops and develop your skills and understanding of BPA theory, principles, and technologies. It is recommended that you be mentored by a qualified, fully-trained bloodstain pattern analyst while you are a BPA trainee. All Bloodstain Pattern Analysis Workshops are available for presentation at host agency locations. Contact Toby (Toby.Wolson@gmail.com) for information about hosting a bloodstain pattern analysis workshop at your agency.